Gold’s strength in the 2000s was not a rally, as many have deemed it, but a bull market. Gold’s rebound in 2016 was a rally. Nevermind the Gold pundits who insist Gold is in an invisible or stealth bull market or even a correction. A market that pops for seven months then doesn’t make a new high for almost two and a half years is not a bull market. 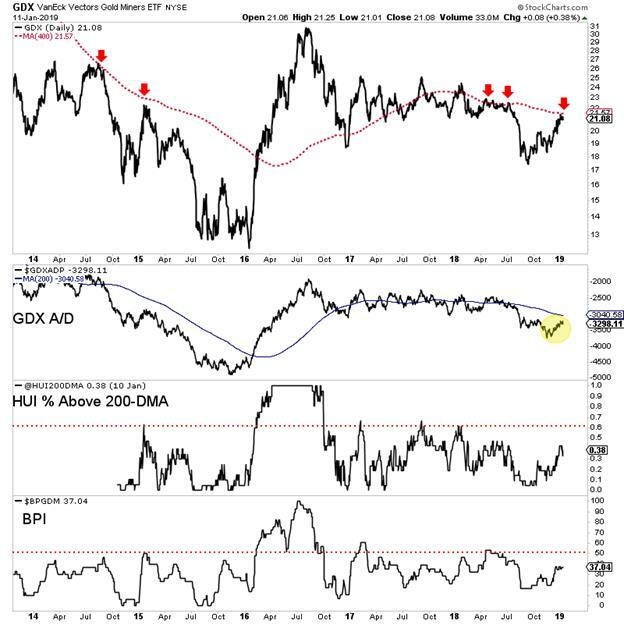 Despite the recent recovery, precious metals are not in a bull market yet. Let’s use the gold stocks to exhibit this. 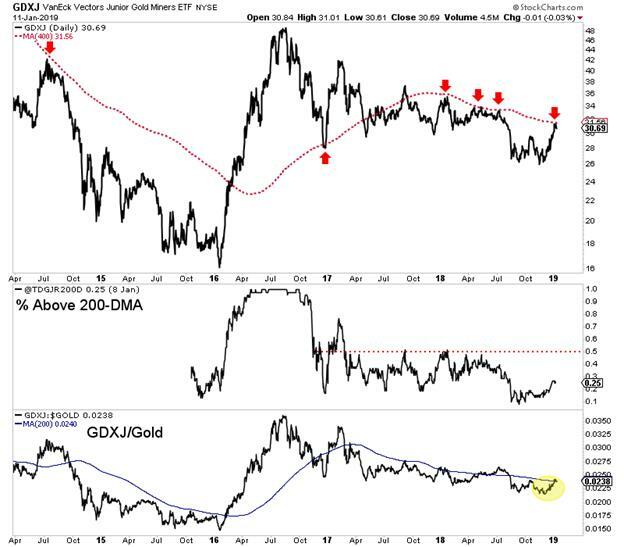 The 400-day moving average provided resistance for GDX in 2012, 2014, 2015, several times in 2018 and at present. It’s holding GDX for now. The breadth indicators don’t signal a bull market either. These things could obviously change at some point. On the fundamental side, we’ve noted that the start of rate cuts (given the current context) will confirm a bull market. In the meantime, weak economic data and the S&P 500 threatening recent lows could bring us much closer. For now, we want to own stocks based on their own value and merit. In other words, we want to own stocks that can move without the Gold or Silver price. There will be plenty of time to get into cheap juniors that can triple and quadruple once things really get going. Recall that many juniors began huge moves months after epic lows in January 2016, October 2008, May 2005 and November 2000. Don’t chase the wrong stocks right now. 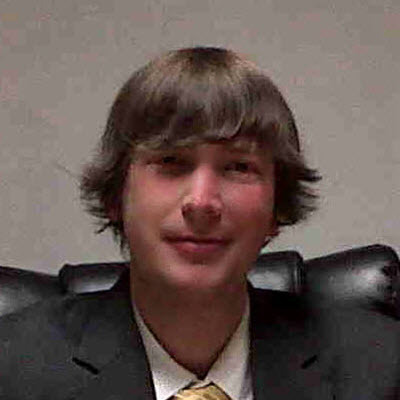 To prepare yourself for some epic buying opportunities in junior gold and silver stocks.